This year, our event schedule is powered digitally through our A.C.R.E Toronto app. All in one place: everything you'll need to plan your weekend including venue information and detailed event schedules! You can also connect with our team and pre-register for additional sessions throughout the weekend. Click this link to view detailed download instructions for your phone! Are you ready to transform your life, your business and your portfolio? Authentic Canadian Real Estate (A.C.R.E) is your opportunity to make ONE decision that will benefit you for the rest of your life. 100% Satisfaction Guaranteed. A.C.R.E IS REVAMPED, REVITALIZED & REVOLUTIONARY! It's a daunting but epic time in real estate investing. 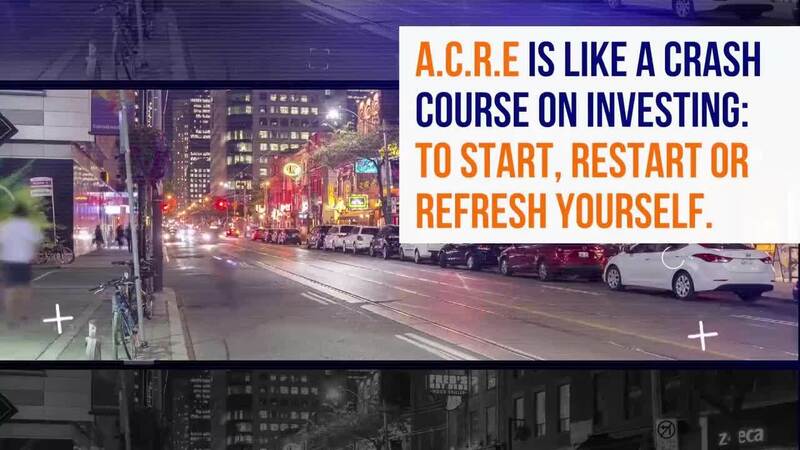 Given the place we are in Canada's economy and in the real estate cycle, this year's A.C.R.E is more important than ever before (and unlike any A.C.R.E of the past!) Real estate is in the middle of a transition and the best way to ensure you come out on top is not by managing the transition, but by transforming yourself and your investment strategies. ⦁ REVAMPED Agendas: Real estate cycles have shifted, government influences are heavy and financing is becoming increasingly difficult. We're delivering unique strategies to leverage economic uncertainty and timely solutions to implement RIGHT NOW. ⦁ REVITALIZED Data: What's Behind The Curtain and up-to-the-minute statistics within the Real Estate Cycle demonstrating exactly where and what to invest your hard-earned dollars in. ⦁ REVOLUTIONARY Technology: Acquire exclusive insights into Google's real estate trends and market updates IN REAL TIME and learn how the integration of prop-tech into real estate is transforming and disrupting the entire industry. Despite slowing markets, real estate investors have a serious advantage by implementing big data solutions, artificial intelligence and analytics. ⦁ Alternative investment locations & options: RSPs, TFSAs, REITs & more! ⦁ And much, much more! Plus, the sought-after foundational A.C.R.E system REIN is known for. New investors will gain access to the proven step-by-step program designed to unlock the secrets behind profitable real estate investing. Developed by Canadians for Canadians, strategic investors have used the A.C.R.E approach to purchase billions of dollars worth of residential properties. At Real Estate Intelligence Network (REIN), we make financial freedom by design achievable - no matter what stage of the game you’re in. A.C.R.E will get you clear on how to start or restart your real estate investment portfolio so you can achieve your goals. "The Future of PropTech with Google"
" Land assembly and real estate expertise from a Platinum Blond"
"Fractional Investing in Global Real Estate using Blockchain"
" Core Power Team Panel"
"Advanced Strategy: How You Can Profit from Limited Liability Partnerships"
"Real estate, politics and policies: How politics shape real estate trends"
"Proper Insurance To Mitigate Risks"
"The Top Marketing Tactics All Successful Investors Are Using - And You Can Steal!" Tickets are available at the door only! Online sales are now closed.